John’s Crazy Socks is a family business that John Lee Cronin, a young man with Down syndrome, and a love for colorful & fun socks, co-founded with his father Mark X. Cronin in 2016. John had the idea to start the business with his father after studying retailing and customer service at his local tech high school. The company’s mission is to spread happiness through socks. Each order comes with candy and a thank you note from John. In addition to offering one of the broadest sock selections available – more than 1,900 kinds of socks – the company has a social mission of inspiring others and donating a portion of their earnings to charity. 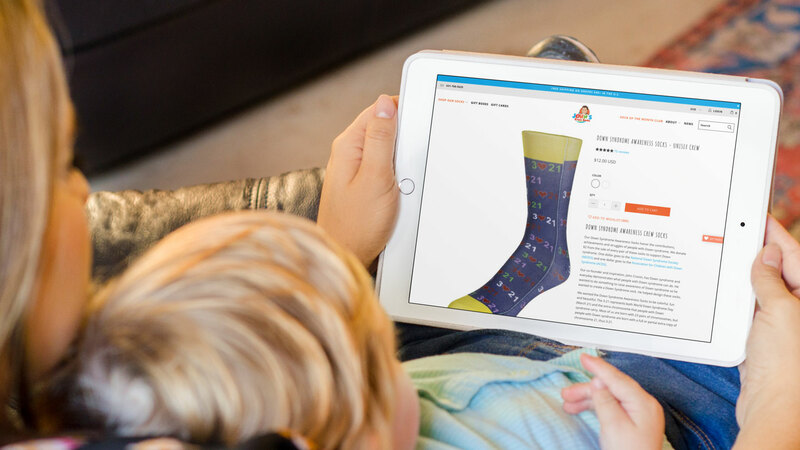 One of the key challenges John’s Crazy Socks faced was finding an effective way to tell their inspiring story to connect with their customers while making it easy to shop for their products. “We were struggling with that, because if all we did was put socks up, the customer isn’t connecting with our social mission. But if we tell you too much about the social mission, then we get in the way of the socks. The company engaged Ethercycle to upgrade their website design to look more professional, tell their story better, and help people find the right product. Their goal was to improve conversion rate and customer lifetime value. We installed and configured a Turbo theme by Out of The Sandbox to make the website more inviting and easier for the customer to use. We chose a layout approach that would showcase their large product selection without overwhelming the customer and effectively present their twin social and retail missions. As a result of the project, John’s Crazy Socks saw a 139% increased conversion rate and 10% increased average order value. The site was also able to handle a huge bump in traffic and order volume when John and Mark made a couple appearances on national and international TV news programs. “The work Ethercycle put us on a solid platform for growth that we saw in the last quarter. We were already doing well with our previous site, but this was better. It runs faster, it’s easier to navigate, it makes our mission tangible. It conveys more of who we are. It’s lead to higher conversion rates. We’ve continued to work with John’s Crazy socks on other projects to increase sales. To retarget visitors after they had left the website, we helped John’s Crazy Socks with their Facebook ad setup. The result was an 8-10x rate of return on their Facebook ad buy. We also helped the company with their email automation, expanding and optimizing their cart reminder email workflows in Klaviyo. The result was an increased rate of purchases from customers that had abandoned cart, as well as improving customer lifetime value. “I’ve contracted plenty of web developers, designers, and marketing professionals over the past decade. I've had lots of bad experiences with other people that over-promised and under-delivered, vanished when I needed them, or wound up charging considerably more than the estimates they quoted.